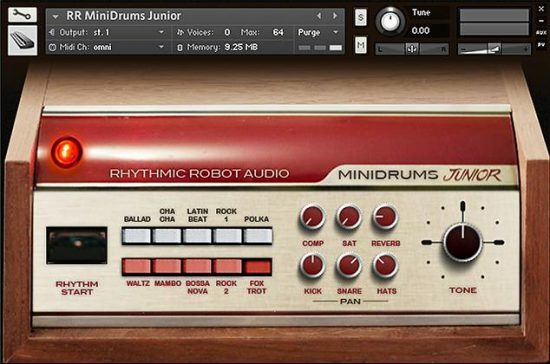 Meticulous recreation of the world’s first ever drum machine • Tape-based loops of real percussion performances – now syncable to your DAW tempo • Individual kit pieces harvested from the original patterns • Create your own 1950s-vintage beats and layer them with authentic rhythms • Dense, saturated sound and comprehensive rhythmic control • Rock beats, shuffle breaks, jazz fills and Latin percussive loops… plus roll your own! 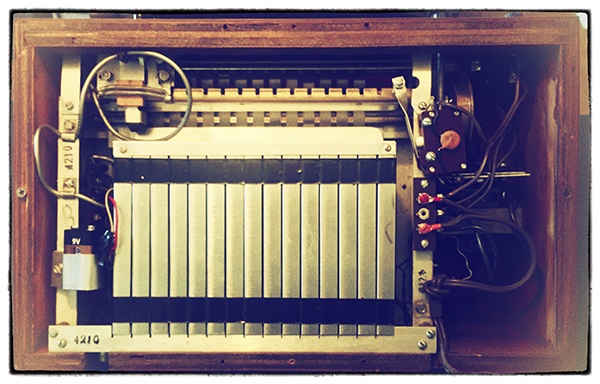 Starting life in 1949, the Rhythmate is – by a decade or more – the world’s very first drum machine. 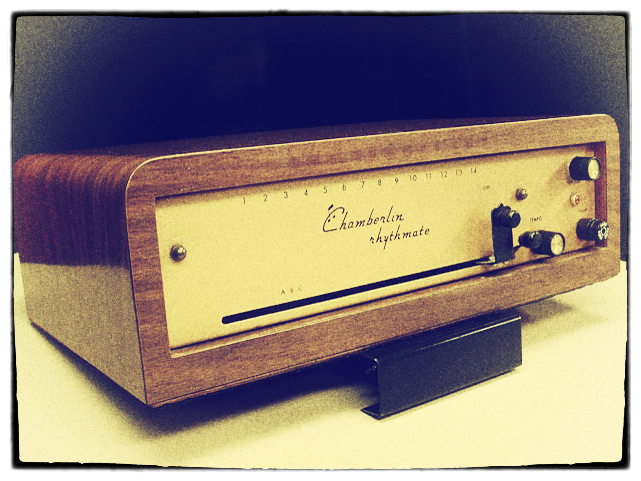 It was invented in California by Harry Chamberlin, who had the flash of genius to realise that rhythmic performances recorded to tape could form the core of a replay instrument. 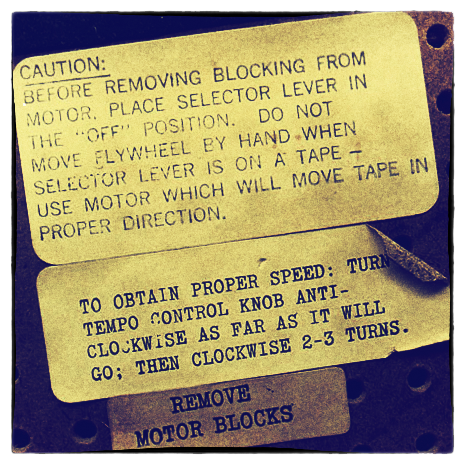 He designed and built ten or so units of the Rhythmate in his garage, before moving on to a more ambitious project incorporating the same tape-replay technology into a keyboard: which gave birth to the Chamberlin, and subsequently the Mellotron (which, though not developed by Harry, was to all intents and purposes a direct copy of his design – Mellotronics ended up paying him a $30,000 settlement after admitting as much). The keyboards went on to define part of the sound of rock recording history in the 60s and 70s – everyone from the Beatles to Yes and Genesis – but here we’re looking at those machines’ direct ancestor: a lovingly-crafted, hand-built cabinet out of which comes the sound of your own personal rock ‘n’ roll band, percussion section, jazz groove or Cajun stomp. The Rhythmate uses a one-inch loop of magnetic tape to store recordings of separate drum and percussion performances, which can be accessed by shifting the replay head across the tape’s tracks. Lodging the head in between adjacent tracks can get you some cool crossfaded combinations – a facility we’ve included in our version – while adjusting the tape speed gives you a wide tempo range. This being tape, shifting tempo also inevitably shifts pitch; you can tune cabasas down into brush shuffles, or pitch military snares up into castanets. This was, back in 1949, an inescapable limitation of the technology; now, it’s an opportunity for creativity, since with our version you can choose between pitch-shifting and beat-slicing. More on this in a moment. The sound of the Rhythmate is dense, raw and deeply saturated: these loops were clearly recorded hot, and seventy years of wear and tear has given them a massive amount of further character. But the loops themselves are very neatly handled – Harry clearly knew his way around a splicing block – while the range of rhythms and styles on offer is impressive also: forget Foxtrot and Cha-Cha, here you get actual jazz drummers riffing, or bongo players slamming it, plus loops in 7/8 and other funky time signatures just to keep you on your toes. And of course the whole sound is infused with the atmosphere of the 50s, so it brings an instant dose of nostalgia to any track you place it in. Given that these things are rarer than hens’ teeth and are selling for upwards of $12,000 on eBay, we were very lucky that our friend Jay Cloidt happens to own one. Our Rhythmate was designed with three goals firmly in mind: firstly, it aims to recreate the original machine, warts and all, so if what you’re after is a period-authentic set of looped percussion rhythms, we’ve got you covered with the Loop 1 and Loop 2 sections of the front panel. Secondly, though, it brings some modern technology to bear on those loops, so as well as slowing and speeding them in a tape-based manner, you can also engage the Slice switch to beatslice them and sync them to your host tempo; plus there’s tonal control, a high-pass filter, and the option to play both loops simultaneously for those all-important “playback head lodged between the tracks” mashup feel. 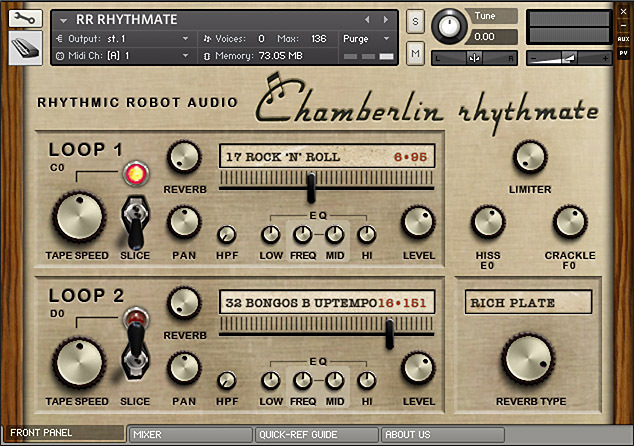 Thirdly, we’ve massively expanded the usefulness of the Rhythmate by harvesting individual drum, percussion and cymbal hits from the loops – allowing you to create your own beats in whatever style you like, but with the sonic stamp of the Rhythmate’s oxide and saturation adding its mojo. This can lead to some seriously unique flavours of sound: check out our four versions of the Amen break in the audio demos to see what we mean here. 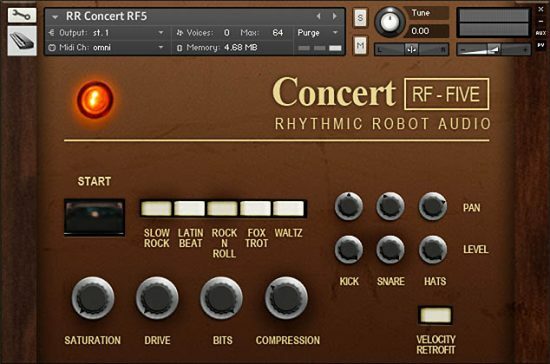 There are literally dozens of sounds available, spread over 7 octaves of MIDI keys – and each has multiple randomised round-robins, for lots and lots of natural variation. There are in fact over 1050 samples in all, covering kicks, snares, hats, rides, crashes and a whole wonderful world of Latin percussion. 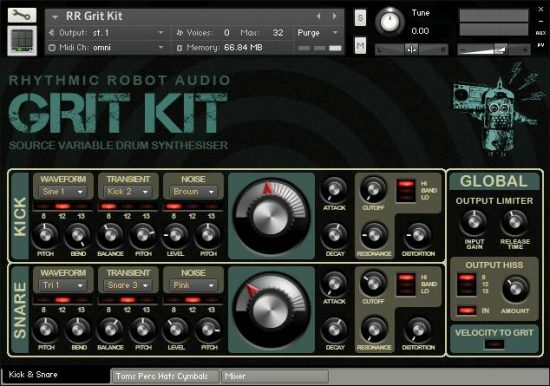 Using these, you can program your own rhythm tracks that sound as if they’re being beamed back at you right from the 50s! Helping to amp up the vintage vibes, we’ve included tape hiss and vinyl crackle on their own MIDI keys and with their own controls, to give that “sampled from an old 12-inch” flavour to your breaks; and finally there’s a useful Quick-Reference Guide on its own pane, with a breakdown of the workflow to follow if you want to sync Rhythmate’s preset patterns to your track tempo. In short, this involves first dialing the Tape Speed control up or down until the loop approximately matches your track speed; and then engaging the Slice switch to lock the beat to the tempo. Though of course there’s nothing to stop you abusing these controls for creative purposes if you want! With unusual, leftfield onboard patterns, extensive creative control, dozens of saturated drum hits and a genuinely inspiring sound, Rhythmate is the antidote to clean drum machines. This thing has been around the [tape head] block many times over the past seventy years, but still remains a cult classic due to its tiny production run and ridiculous price. It is a genuine piece of music recording history. Now at last you can add its unique voice to your mix. It’s been quite a while since I’ve seen advanced notice of a Kontakt pack and thought “OMG YES!”. Just got the email earlier and actually rushed to the PC to click on the link and grab it. 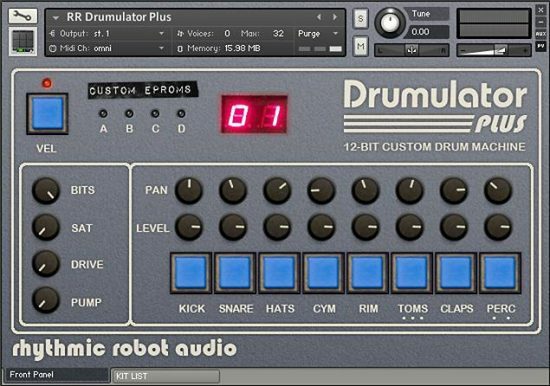 I’ve had a few samples from a Rhythmate before (from IK’s old Sampletron) but that sounded nothing like this! Hidden behind the lovely olde worlde interface are not only the original loops syncable to your DAW but individual hits taken from those loops and mapped across the keys so you can use these ancient sounds in your own patterns.